In the final analysis perhaps it only makes sense to distinguish two kinds of music - good and bad. Obviously, this statement can easily lead to bald tautology, since such a classification, without qualification merely begs the question (rather subjectively). Yet it is also true that once musical culture, the history of musical forms and styles, sociology, fashion and other moderators of taste (as well as one's own sensibility) have all made their contribution , it only remains to us to choose, out of the infinite range of possibilities, that which comes closest to what we might call 'our spirit'. For music, when invested with truth and beauty, affects our entire being and is , beyond all possible categorisation, an appeal to our most intimate self. Music is an anchor cast into the furthest depthes of our consciousness and soul, only when both are intimately touched does music stand as a clarifying code which appeals to the totality of existence (as Fray Luis de Leon so magnificently expressed it in his poem to the musician Francisco de Salinas), to the cosomos, at the same time as to our innermost selves. Trembling and consciousness are the twin anvils upon which musical language strikes. 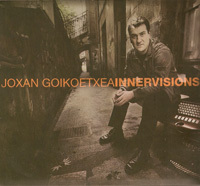 I believe Innervisions to be a very personal outpouring of compositional and formal elements which have left their mark on Joxan Goikoetxea's soul - moments of music which as they came into being clave to his sensibility and taste as well as being movitating influences in the career of this musician who is plural, varied and interdisiplinary like few others. In Innervisions there are, moreover, chunks of our history in the sense that they hark back to a generation which sought the meaning of all things, not from within formal cannons and stylistic restrictions, but as a balance of very diverse expressions (conventional classical music, specific repertoires, traditional modes, modern songs), moving towards the emergence of musicality as emotion, understanding and testimony. Music, technically and formally, is architecture of sound, however, it is also in its deepest sense a territory of searching and encounter. To feel profoundly concerned for music which speaks to us and moves us is to find ourselves again in the private chambers of the memory, recalling those moments when we became aware of the birth of a certain (shared)identity of styles, resonances adn tastes. 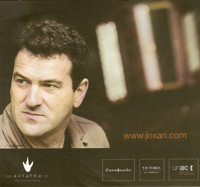 Music may therefore be, as in this disc, by Joxan Goikoetxea, the place where we have felt an under-current of humanity which, through the exhilaration of the senses, draws us close together in the face of the vicissitudes of life. And now, what remains is the music. The moment that transcends all verbal discourse, because music can only really be explained in the deepest sentient part of each of us.